Visitors at a previous edition of GIF. GULF Industry Fair (GIF) 2015, which opens this month (February 3 to 5) in Bahrain, continues to enjoy high-level support of organisations spearheading Bahrain’s investment programmes. It will take place under the patronage of the Prime Minister of Bahrain, HRH Prince Khalifa bin Salman Al Khalifa at the Bahrain International Exhibition and Convention Centre (BIECC). For this year, HCE is looking at building on the success of the B2B value of the exhibition, said Jubran Abdulrahman, managing director of Hilal Conferences and Exhibitions. For instance, the overwhelming success of the Virtual Exhibition launched at the last year’s edition will be further improved to offer interviews and information about participating companies, to prolong exhibitor exposure to the wider global online business community for a further 200 days after the exhibition, he added. The key organisations backing the GIF 2015 are: Aluminium Bahrain (Alba), one of the world’s largest smelters, which is currently spending at least $2.5 billion on a sixth production line; Bahrain Petroleum Company (Bapco), which is in the midst of a multi-billion-dollar refinery modernisation programme; and Majaal Warehouse Company, which earlier in 2014 announced it had completed and fully leased all three phases of its 37,000-sq-m industrial real estate project in Bahrain Industrial Wharf. Ahmed Mansoor Al A’ali (AMA) will sponsor the industrial processes and manufacturing’ segment, while Arab Shipbuilding and Repair Yard (Asry), one of the Gulf’s leading shipyards will sponsor the ports and maritime segment. Kooheji Industrial Safety, Bahrain’s top safety equipment provider for industries, will be showcasing its newly launched line of products called Honeywell PPE (Personal Protective Equipment), which covers helmets, goggles and safety shoes. Kooheji Industries have provided 25 years of services for Bahrain’s biggest companies such as Bapco, Tatweer Petroleum, Alba, Bahrain Airport Company, Gulf Aluminium Rolling Mill Company (Garmco), Bahrain Defence Force (BDF) and Bahrain Steel. 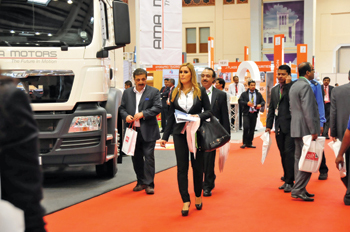 Alwardi Group, Bahrain’s leading industrial transport and plant hire company, will be showcasing 40 years of successes and achievements at the fair. Alwardi currently has the largest fleet of heavy goods vehicles, plant and equipment in Bahrain with more than 500 units and a workforce of 750. Today Alwardi is the sole distributor for Alba and Awal Gulf Manufacturing Company (Awalco). A highlight of the event will be the staging of a groundbreaking seminar by Ducab, one of Middle East’s leading manufacturers of high quality electrical cable wires and copper products. The seminar conducted on the new Code of Practice is entitled BS 8519:2010 ‘Selection and installation of fire-resistant power and control cable systems for life safety and fire-fighting applications’. It will be led by Ian Watts, project manager, technical department, Ducab-AEI Cables, UK. Watts, who has 30 years experience in the cable industry, has worked with the former BICC Cables, Balfour Kilpatrick and Tyco Thermal Controls UK. Additionally, Gulf Industry Fair will feature a vocational element Comgroup Training4Life workshops, organised by Medpoint Design and Events Management in association with Lead Academy; and for the first time, host ITE CH Industry 2015.